Samsung announced two new mobile SoCs at MWC today. The first is an update to the Exynos 5 Octa with the new Exynos 5422. The 5422 is a mild update to the 5420, which was found in some international variants of the Galaxy Note 3. The new SoC is still built on a 28nm process at Samsung, but enjoys much higher frequencies on both the Cortex A7 and A15 clusters. The two clusters can run their cores at up to 1.5GHz and 2.1GHz, respectively. The 5422 supports HMP (Heterogeneous Multi-Processing), and Samsung LSI tells us that unlike the 5420 we may actually see this one used with HMP enabled. HMP refers to the ability for the OS to use and schedule threads on all 8 cores at the same time, putting those threads with low performance requirements on the little cores and high performance threads on the big cores. The GPU is still the same ARM Mali-T628 MP6 from the 5420, running at the same frequency. Samsung does expect the 5422 to ship with updated software (drivers perhaps?) that will improve GPU performance over the 5420. The launch vehicle for the 5422 is likely the recently announced Galaxy S 5. Although most of what we'll encounter will ship with Qualcomm's Snapdragon 801, we'll likely see some international variants with the 5422. It's also entirely possible that some future Exynos 5422 SGS5 variants will feature an Intel XMM 7160 LTE modem. 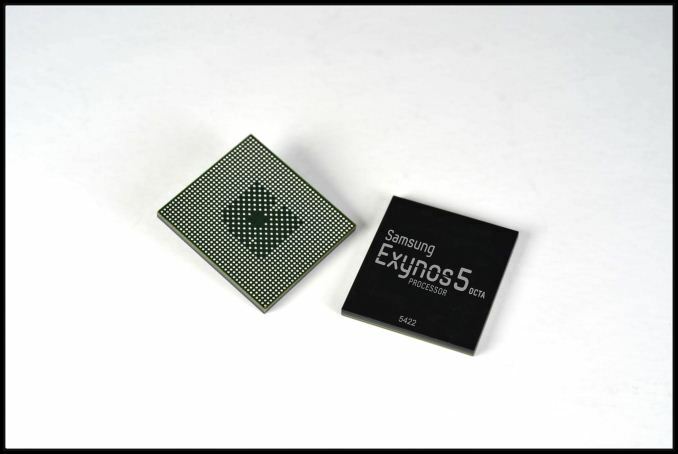 The more exciting news however is the new Exynos 5 Hexa, a six-core big.LITTLE HMP SoC. With a design that would make Peter Greenhalgh proud, the Exynos 5260 features two ARM Cortex A15 cores running at up to 1.7GHz and four Cortex A7 cores running at up to 1.3GHz. The result is a six core design that is likely the best balance of performance and low power consumption. HMP is fully supported so a device with the proper scheduler and OS support would be able to use all 6 cores at the same time. The 5260 feels like the ideal big.LITTLE implemention. I'm not expecting to find the 5260 in many devices, but I absolutely want to test a platform with one in it. 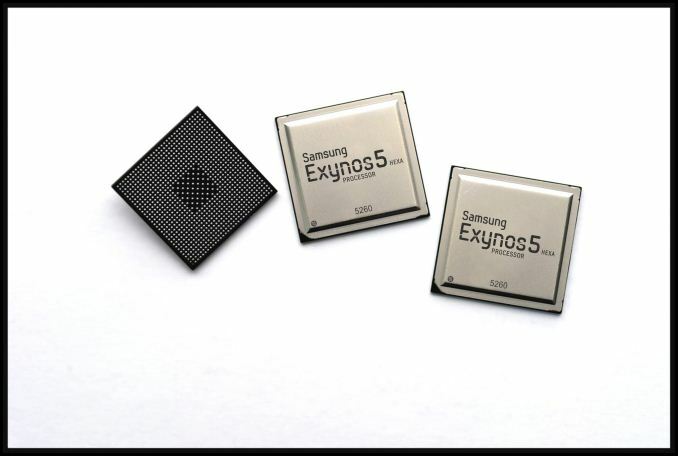 If there was ever a real way to evaluate the impact of big.LITTLE, it's Samsung's Exynos 5260. Samsung didn't announce cache sizes, process node or GPU IP for the 5260. Earlier leaks hinted at an ARM Mali T624 GPU. Samsung's release quotes up to 12.8GB/s of memory bandwidth, which implies a 64-bit wide LPDDR3-1600 interface. As I know it, the A7's are perfectly fine for day to day tasks, it's only on load times that the Cortex A15's are loaded to ramp up and speed up load times. They're kind of like the Nitro for the processors.